Twenty-one years old! It’s time to party and only the very best will do. Get planning to avoid disappointment! If the birthday boy or girl is planning on having a big party for family and friends help make it the best ever! You can do this by buying a dream dress, a killer pair of heels, a few pre-party beauty treatments or even a bottle of premium champagne to get the day and night started on the right note! So how should you prepare them for the party? Take the birthday boy or girl out the week or day before the big night. That way you can do the shopping and the beauty treatments before the rush of the big day. Book treatments at a top spa or take advantage of department store personal shopping services - they are normally free and you get to lounge in style whilst a stylist does all the hard work for you! If she finds a perfect party dress, or if he finds the ideal top for the big day, whip out the card and treat them. It’s a simple, albeit potentially expensive, way of buying them the right gift. Twenty-first birthdays call for grand gestures – after all, we only turn 21 once in our lives so that means jewellery and big names are the order of the day. Head to a renowned jewellery store and pick up a gem for the birthday boy or girl. Whatever you budget is, there will be something to fit it – from sterling silver necklaces or chains to diamond encrusted watches and rings. Let the sales assistants know your budget and purpose for shopping and they will steer you in the right direction towards a fabulous gift.If jewellery isn’t really their thing, choose another luxury item that is worthy of a 21st birthday. This could be anything from designer bags, designer shoes, a prepaid appointment with a world-renowned hairdresser and colourist, a laptop to kick off their professional career, or an air ticket to a dream destination. All you have to do is pick one that you think will have the most impact. Don’t be afraid to club together with friends or family either. These are, after all, extra-special gifts, and they are guaranteed to produce a very positive reaction from the 21 year old! If you want to keep the mood light and if you realistically don’t have a huge budget available, just get some fun gifts. A few bottles of wine accompanied by some coffee and a packet of aspirin for the morning after will go down a treat and get everyone smiling. If they are a big kid at heart you could just get them a toy from their childhood. A pair of roller skates, a skateboard or a remote control car will help them feel young again and will bring back the memories - just don't let them try out the skates after a few bottles of wine! On the other hand, you might be reluctant to head to the shops. The receiver might not really appreciate an off-the-shelf gift and you might not have the funds to buy them something really special. That doesn’t mean that you don’t have any options – homemade gifts work well and are often remembered and cherished for years. How about a scrapbook or photo album, charting the adventures of the birthday girl or boy over the years? Keep it light-hearted and make sure you include plenty of embarrassing baby and school photos! You might even think about turning it into a mini PowerPoint presentation, which can then be shown at the party – provided that the party-thrower has a good sense of humour! This gift requires quite a bit of effort but it is well worth it because it simply cannot be re-created by anyone else. 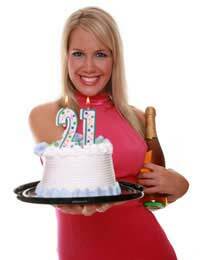 It’s a 21st so get the friends and family together and enjoy the occasion. Give what you can and try to make it a birthday to remember for all the right reasons.